Just to pass along some great news. You will soon have more options to participate in local AWS tasting events. Mary & Rich Berezinsky have made commitments to start-up the Myrtle Beach Chapter again. The MB Chapter tastings will continue on the First Thursday of each month. With an exception for the July event to be held July 11th because of July 4th holiday. During this revival stage, please feel free to contact Mary directly with any plans to attend the June 6th event at her email address mberezinsky@yahoo.com for further details, confirmation & payments. Given the local area Chapters expansion, there will be some further discussion on possibly creating a combined calendar of events for OIB, Shallotte, Southport & MB as an easy reference for your planning. At a minimum, a link to each website. From all the local AWS sister Chapters, we wish best success to Mary & Rich and the Myrtle Beach Chapter! 3/24/19 - Stephen and Gloria Reustle of Reustle Prayer Rock Vineyards made their second visit to the Ocean Isle Beach AWS Chapter. Several members of the chapter are wine club members and the Reustle's have become special friends. In addition to the tasting, the Reustles challenged our palates with fun exercises. We had to discern the six varietals that make up their Matrix blend from a list of twenty white grape varietals. Another exercise involved blending three Pinot Noir clones to find a combination to suit your own tastes. Add in a few raffles, and some delicious pairings, and it all adds up to a fun and educational afternoon. 2/17/19 - The Ocean Isle Beach AWS chapter held a tasting of selected Wine Spectator Top 100 wines at the Silver Coast Winery. Following the business meeting, President Stan Barwikowski showed a video explaining how Wine Spectator magazine selects the Top 100 wines each year. Exhausting but tasty!! The white wines were paired with a selection of olives, fruit salad and English cheddar cheese. Reds were paired with tortellini in red sauce, marinated mushrooms and Italian sausage. 2/4/19 - The OIB Chapter welcomes new member Joann LaMarca. Joann lives in Ocean Isle Beach and has participated in a previous OIB event. Please welcome Joann to the Chapter at upcoming events!! 1/22/19 - The OIB Chapter welcomes new members Velika & Dimiter Gancheva. They live in the Brunswick Plantation community in Calabash and may also be participating in the Southport and Shallotte Chapters as they become more aware of event dates & themes. Please welcome them to the Chapter at upcoming events!! 1/20/19 - The Ocean Isle Beach Chapter hosted 60+ members and guests in the barrel room of the Silver Coast Winery. The theme was a Vertical tasting of (6) Gigi Rosso Barolo "Arione" vintages ranging from 2007 to 2012. Pairings were a variety of meats, nuts and chocolate to explore individual preferences. The event explored the Gigi Rosso vineyard history and rich family heritage as well as Stan & Tess Barwikowski personal visit and stay at the winery during a recent trip. A major thank you to our wine providers & co-hosts Howard (Rusty) & Carol Petrea of Petrea Imports Inc, a small women owned business located in Ocean Isle Beach, NC for 17 years. Petrea Imports specializes in fine Italian wines as importers & wholesalers doing business locally and with the United States Military. The Petrea's are frequent travelers to Italy and used to live there, that brought great personal & educational perspectives for the Barolo Vertical Tasting event. See recent Chapter events section for presentation specifics and also link to Petrea Imports in Local Area - Wine Stores. 1/8/19 - With heavy hearts the OIB Chapter recognizes the passing of Mary Lou Salter of Calabash on January 8, 2019. Mary Lou was a GREAT supporter of the OIB Chapter and a long time member since Oct 2012. Please see her Remembrance Page on our website under the more tab in recognition of her contributions to the OIB Chapter family. 12/14/18 - The OIB Chapter welcomes Mary & Ken Decker. The Deckers were members several years ago and now plan to split their time between MA & NC. Please re-welcome them to the Chapter at upcoming events when they are in town!! 12/3/18 - AWS Holiday Wine Dinner Combined Chapter event at Angelo's in Shallotte, NC. Over 65 members & guests from Ocean Isle Beach, Shallotte and Southport Chapters enjoyed each others company during a five-course dinner featuring the main course of Braised Wild Boar. Each course was paired with a unique wine selection and presented by Angelo's Wine Consultant. The staff, food, wine & evening were fantastic and everyone enjoyed. Angelo’s Pizzeria and Enoteca is an Italian fine dining establishment located in the heart of Shallotte, NC. They offer a wide variety of pizzas, pastas and gourmet Italian dishes that give the authentic Italian feel, especially when paired with one of their famous wines. Angelo's has achieved various awards & accolades within Brunswick County. Thank you Angelo's & Staff! 11/23/18 - Event being held by one of OIB Chapter supporters. 10/25/18 - David (Danny) & Margaret White just joined AWS and the OIB Chapter. They attended as guests at a couple events and just knew they had to join AWS/OIB to continue the fun. They reside in Calabash / Brunswick Plantation and we look forward to their participation in upcoming events. Please welcome them to the Chapter at upcoming events!! 8/20/18 - Wayne & Deborah Neff just joined AWS and the OIB Chapter. They reside in Calabash / Carolina Shores and we look forward to their participation in upcoming events. Please welcome them to the Chapter at the next event!! Steve & Gloria went on to present their winery business, success & complete wine offerings the next evening to over 75 members/guests at the regularly scheduled Southport Chapter meeting. 7/22/18 - The OIB Chapter Board convened to discuss various topics; Chapter size going forward, Member roles, Revitalized website, Website content & suggestions, Social media accounts, Financials, Future chapter events & potential trips. Overall a great planning discussion, multiple ideas, roadmap for continued success. 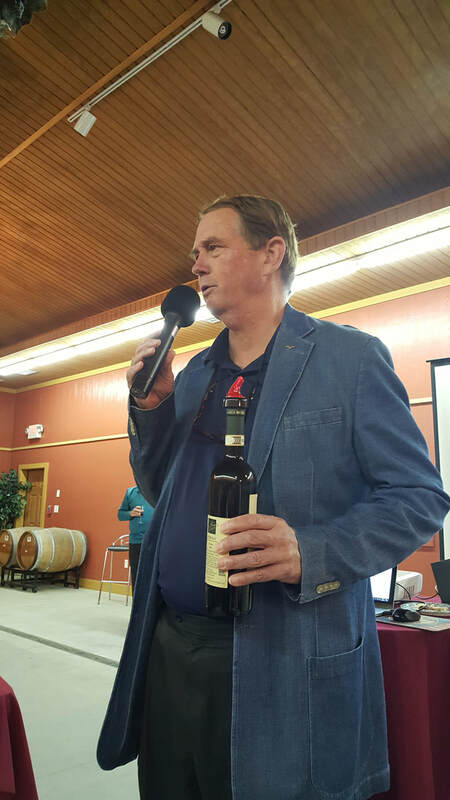 The Ocean Isle Beach Chapter recently held its 6th annual amateur wine competition. The competition is held in support of the Museum and Planetarium of Coastal Carolina and receives entries from across the US. This charitable endeavor by the chapter has raised over $5,000 in support of the educational activities of the Museum and Planetarium. This year’s competition attracted wine submissions from 11 states and included varietal, fruit and fortified wines. Judging was held at the Silver Coast Winery. Our panel of judges included AWS-certified wine judges Linda King, Jane Duralia and Rege Duralia, along with Dana Keeler, winemaker at Silver Coast and a wine judge. Tom King helped with back room activities to ensure a smooth flow of wines to the judges. The chapter, as part of its normal monthly tasting, held an award ceremony for all amateur winemakers who could attend the event. Prior to the award ceremony, the chapter used the medal wines as part of a judging exercise, where all members and guests were able to be judges for the day. The exercise required each table to evaluate the 3 wines on their table and properly identify the gold, silver and bronze wine. The table that correctly identified each wine won lottery tickets for each table member. Six local winemakers were able to attend the event and received their award packages. Each winemaker award package included all medals won, certificates for each wine submitted (whether the wine won a medal or not) and a summary of judging comments for each wine. Following the award ceremony, all in attendance were treated to a light meal. Winemakers will also be recognized at Wine Fest 2018, the museum’s major fundraiser. Gold medals were received by Stephen Barwikowski, Brunswick Community College, Luke Capotosto/Barbara Medeiros, Darrell Dail, Chris Hoppe and Jeff Puryear. 2/25/18 - The Ocean Isle Beach (NC) Chapter held a tasting of wine from Reustle–Prayer Rock Vineyards, held at the Silver Coast Winery. There were 60 members and guests in attendance, making it the largest attended chapter event to date! 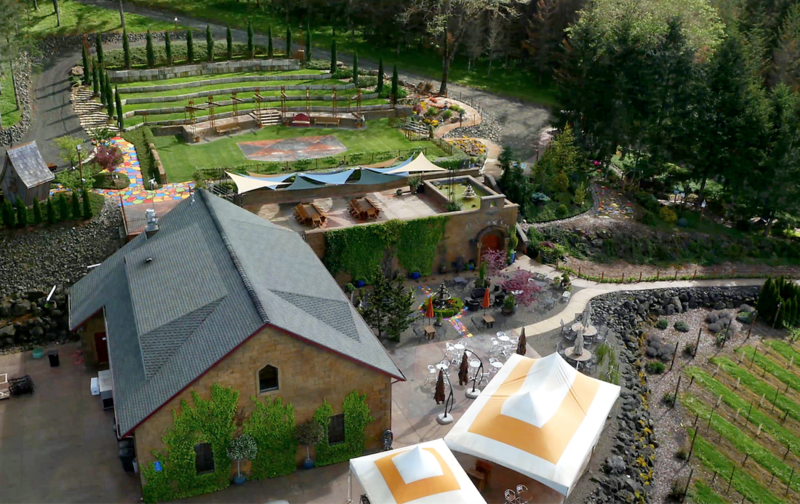 Prayer Rock Vineyards is located in the Umpqua Valley of Oregon. The vineyards were carefully mapped by Steve Reustle, owner and winemaker, to ensure that each variety, clone and rootstock matched the diverse hillside soils and unique micro-climates. Using only fruit from the estate, winemaking is kept to small lots preserving the distinctiveness of each varietal and clone. In 2010, Reustle– Prayer Rock Vineyards was named the 2010 Small Winery of the Year. Since then they have continued to garner critical praise culminating with Wine Press Northwest magazine naming them the 2017 Pacific Northwest Winery of the Year. Our tasting consisted of seven award winning wines. Many of these wines have won double gold and Best in Class awards. Guests were greeted upon arrival with a glass of Matrix, a yet to be released white blend. Our members raved about all the wine presented.